This Mother’s Day, we challenged you to come up with a healthy makeover of your favorite comfort food. Our four winning recipes look delicious and we can’t wait to try them out! 1. Toast the pecans in a skillet over medium heat for 3 minutes or until fragrant; set aside. Add 2 teaspoons canola oil to the same skillet, and increase heat to medium-high. Add pears, and sprinkle with brown sugar or agave nectar; do not stir. Cook the pears 5 minutes or until lightly browned on bottom. Stir to melt the brown sugar or if using agave till coated. Transfer the pears to a plate. 2. Add remaining 1 teaspoon oil to pan. Add shallot, salt, and pepper. Stir 30 seconds or until fragrant. Add apple juice, cider vinegar, and mustard. Whisk; simmer 3–4 minutes or until slightly reduced. Add pears. 3. Place spinach in a large serving bowl. Pour pears and dressing on top, and toss. Divide salad evenly among 4 plates. Arrange Gorgonzola or goat cheese and pecans on top. Serve immediately. 1. In a large pasta or stock pot, heat oil. 2. Add onions and cook until soft. Add garlic and cook while stirring 2-3 minutes. 3. Add tomatoes with juice, stock, crushed tomatoes, basil, and oregano. Bring to a boil; simmer for 10 minutes. 4. Add roasted red peppers, thyme, salt, and pepper. Bring back to a boil; simmer an additional 10-15 minutes. 5. 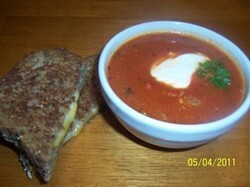 This recipe is great topped with a dollop of Greek yogurt, and served with a whole grain grilled cheese sandwich. Or serve with a whole grain roll and a fresh spinach salad. 1. Melt 1 tablespoon butter in skillet, add chopped onions and leeks, turn down heat, cover and allow to caramelize. Add chopped kale and garlic, cook another 5 minutes until bright green. 2. Cook potatoes in large pot with just enough lightly salted water to cover until soft (roughly 20 minutes). Pour off excess water. 3. Back on low heat, add remaining 1 tablespoon butter, milk and salt, and mash until smooth. Season with salt, pepper and nutmeg to taste. 4. 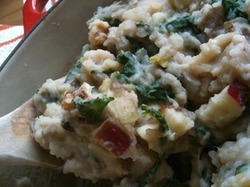 Fold in kale-onion mixture, walnuts, apple pieces and cheese cubes. Watch the cheese cubes begin to melt as you serve onto plates. 2. Cook veggies first, give a quick stir fry till tender. 3. 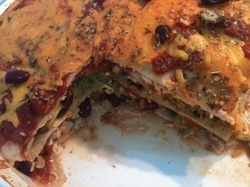 Layer the tortillas as you would lasagna noodles, sauce, veggies, beans and cheese. Do you have any comfort food makeover recipes that you would like to share?